EVERYONE has the right to be free from hunger. It shouldn’t be about what you look like, where you were born or what’s in your wallet; it’s how you live your life and contribute to your community that defines you in this country. Building on the traumatic separation of families at the border, the Trump administration wants to block immigrant families from having a permanent, secure future in the United States and scare them away from seeking access to health care, nutrition and housing programs. For the first time ever, this will include if they use SNAP (food stamps), Medicaid and housing assistance to help make ends meet. If this regulation moves forward, only the wealthiest immigrants could build a future in the United States. Let’s be clear what this is. Under the proposed regulation, the “public charge” rule would establish a rigged immigration system where green cards would only be available to a wealthy few while immigrant families with modest incomes—many with U.S. citizen children—could be denied the possibility of a permanent future together. This regulation is part of the Trump administration’s ongoing effort to divide the country and vilify immigrants. The new policy would limit the ability of lawfully present immigrants to complete their residency process if they access services to cover their families basic needs, including SNAP benefits, Medicaid and Section 8 housing assistance. 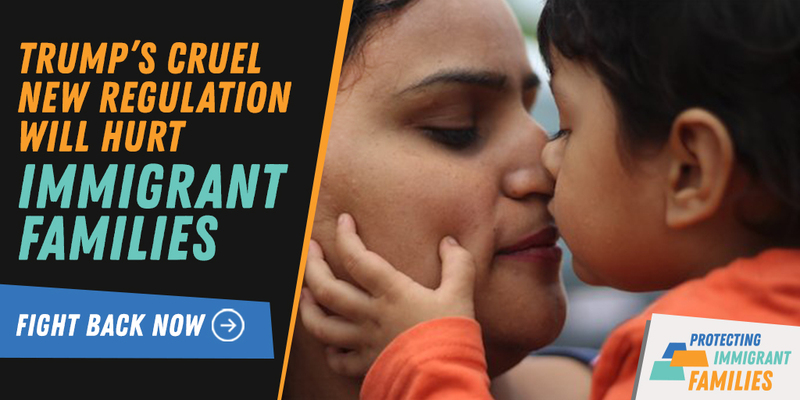 Under the proposed rule, immigrant families would be forced to make impossible choices between accessing vital programs that safeguard their health, nutrition, housing and economic security and keeping their family together in the United States. Because one in four American children have at least one immigrant parent, this could impact millions. It would make us a sicker, poorer and hungrier nation. The most effective way to make an impact is to write a public comment opposing this regulation. By federal law, all original comments must be read and taken into consideration, so please personalize your comment to maximize your impact. The National Protect Immigrant Families Coalition has created a simple tool to make a comment, and have set a goal of generating 100,000 comments nationwide. Our partners at Causa have set a goal of generating 1,000 comments from Oregon. Making a comment is easy… It’s a lot like writing an email to your member of Congress. The only difference is your comment will become part of the public record. Individuals, organizations, and community leaders are encouraged to make comments. The 60-day comment window is open through December 10. If you would rather upload your comment as a PDF, make your comment directly at regulations.gov. Protecting Immigrant Families Website – the nationwide coalition leading mobilizing efforts. Includes fact sheets, comment tool and other resources. “Know the Facts About Public Charge” Fact sheet from Oregon Immigration Resource, available in English, Spanish, Russian, Somali, Vietnamese, Chinese, and Arabic. Resource Library on the Impact of the proposed rule on hunger in America. From the Food Research and Action Center (FRAC). Includes fact sheets specifically about the potential impact on SNAP and a toolkit for organizations. Statement from Causa Oregon, which leads Oregon’s response. Joint Statement from Oregon Advocates, including Hunger-Free Oregon. Join the Protect Oregon’s Immigrant Families community. We need a strong coalition of organizations in Oregon standing up against this proposal. We are grateful for the leadership of Causa who leads this coalition, and we ask you to join.